Patty A. Kelly joined the Centre for Writing and Scholarly Communication (CWSC) in May 2018. 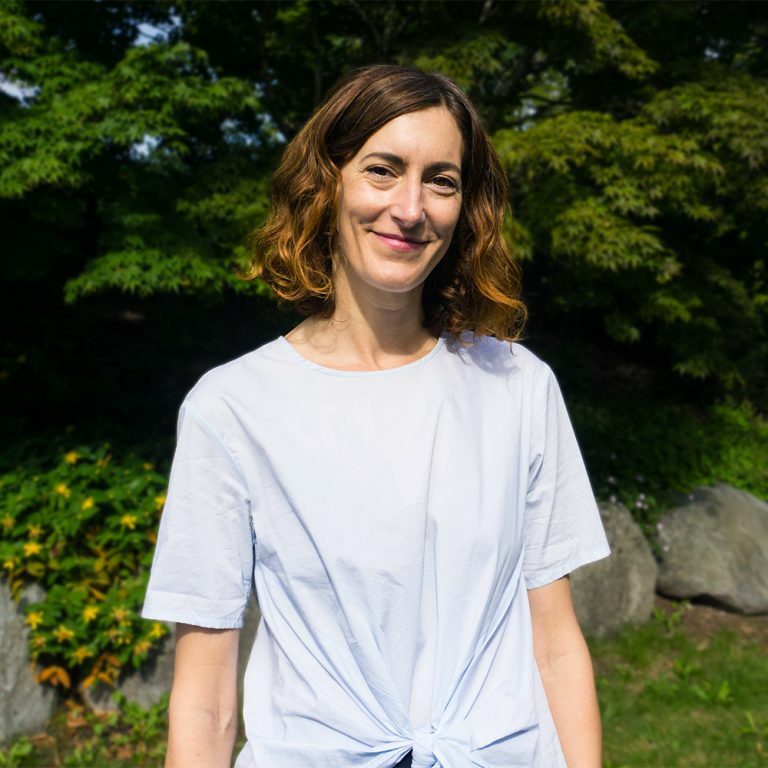 Prior to the CWSC, Patty was a faculty member in Arts Studies in Research and Writing at UBC, where her courses focused on introducing undergraduate students to the research culture and writing practices typical of the humanities and social sciences. 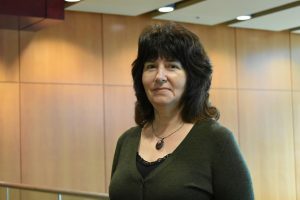 In her current role, Patty collaborates with the campus community to deliver writing services and programs that enhance scholarly communication for undergraduate and graduate students across the disciplines. In addition to designing writing services that help students meet their educational goals, she looks forward to developing and engaging in campus-wide writing initiatives for postdoctoral fellows and faculty members. 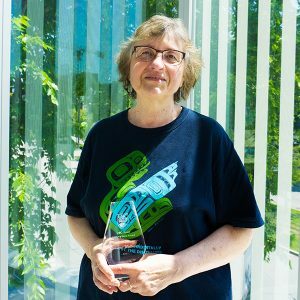 UBC Library is pleased to announce that Eleanore Wellwood, Wendy Traas and Anne Lama are the 2018 recipients of UBC Library Recognition Awards. 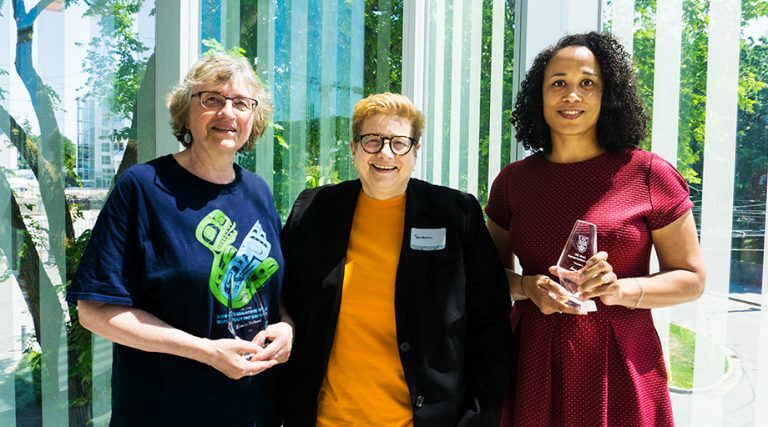 Each year, the Library Awards Program shines a light on those employees who have demonstrated exceptional creativity, innovation, excellence and a dedication to customer service through their work. The awards were presented at the annual Library Recognition Luncheon at the Robert H. Lee Alumni Centre on June 19, 2018. Congratulations Eleanore, Wendy and Anne, and thank you to everyone who participated by submitting nominations. Eleanore Wellwood, University Librarian Susan E. Parker, and Anne Lama. Eleanore Wellwood (Technical Services Library Assistant, Xwi7xwa Library) is honoured as this year’s Unsung Hero. Our Unsung Heroes keep the Library’s programs, services, and infrastructure running smoothly, and when they do their jobs well, their work is seamless and often goes unnoticed. A clear example of inveterate dedication, Eleanore delayed her own retirement in order to help her branch catch up on major collections projects, and her efforts and knowledge have resulted in increased findability of materials within her branch. Wendy Traas (Reference Librarian, Education Library) is the winner of the Innovation Award, which recognizes the achievements of Library employees who bring uncommon creativity to their work. Recipients of this award often apply new ways of thinking to existing processes or seek to expand or enhance the delivery of services and expertise across our campus community. Through her work, Wendy demonstrates imagination and risk-taking, but also a pragmatic and strategic vision. 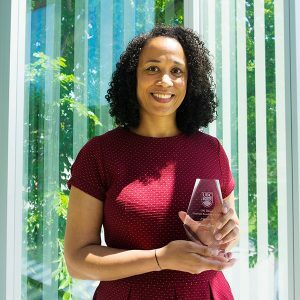 She has innovation as the heart and soul of her DNA, and her desire for improvement in information literacy led to her award of a $18,000 TLEF grant. Anne Lama (Conservator, Technical Services) earned the Employee Excellence Award, which is given to those whose track record for quality work is matched only by the kindness, compassion, and respect that make their contributions so effective. An essential service partner in every major collections project the Library undertakes, Anne is also strongly committed to teaching, learning and mentorship. She takes every question as an opportunity to develop awareness of our individual and joint responsibility to care for our collections.